Just experimenting with the WordPress gallery feature. I thought I’d collect together all the info on the various prints I’ve done in recent years. Black Rock lido was formally opened on 8 August 1936. It was designed by the Borough Engineer David Edwards in ‘Seaside Moderne’ style. The pool closed in 1978 and the changing room and cafe buildings demolished. It is currently a car park for coaches. This is the only print I’ve done of a building that no longer exists. The Grade II Listed Astoria was designed by Edward Albert Stone, who also designed the Astorias in London. The Art Deco auditorium decorated by Henri & Laverdet seated 1,823 people. It opened on 21 December 1933, closed in 1977 and was a bingo hall until 1996. Its owner Mike Holland plans to demolish it and build a ‘media hub’ on the site. The Astoria Moving Picture Trust is working to save it. Although there has been an airport on the site since 1910, the Grade II listed terminal building was designed by Stavers H Tiltman and opened in 1936 and is still in use with a modified tower. It has appeared on TV in Agatha Christie’s Poirot and the film The Da Vinci Code. Some of my prints will be available at the Dragonfly House, 48 Ditchling Rise, Brighton, as part of the Xmas Open Houses. Next weekend 4 and 5 December is the last weekend they’ll be open. Unfortunately, my Saltdean Lido isn’t printed yet, tho there are Moo cards of it available. Well, at long last I’ve finally done a digital print of Saltdean Lido, after years of messing about with watercolours and linocuts. 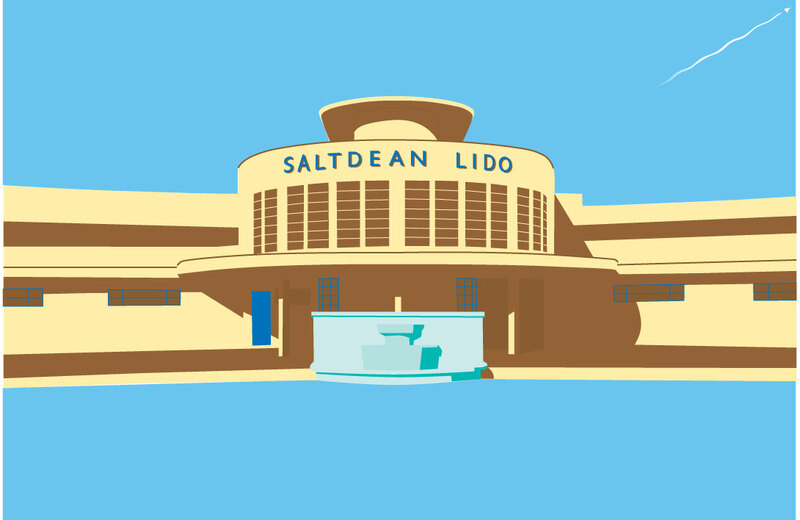 Yes, I know it looks rather like the logo for the Save Saltdean Lido campaign, but that’s just the way it came out, straight on in my regular limited palette of colours! Those of you typographically inclined will notice that I’ve reinstated the original Gill Sans lettering. I think that slab serif font used now comes from the 1950s, and the 1998 refurbishment since I’ve lived down here ruined the kerning of the signage compared with the reference photo (wot I took way back in the late-80s) that I used for this print, squashing it all up a bit, as is the modern (rather than Moderne) way. All I have to do now is fire up the giclee machine and print a few off for the Xmas Open House at the Dragonfly House. Saltdean Lido was built in 1937-38 to designs by the architect Richard W H Jones, who also designed the Ocean Hotel (once owned by Butlins) up on the hill. On 13 July 1987 it was granted Grade: II listed status. There is some debate about the reason for the platform above the building – some say it was for a planned cable car running down from the Ocean Hotel, but I believe that’s an urban myth! But there once was a sort of tower on top with a flagpole. Old photos here. 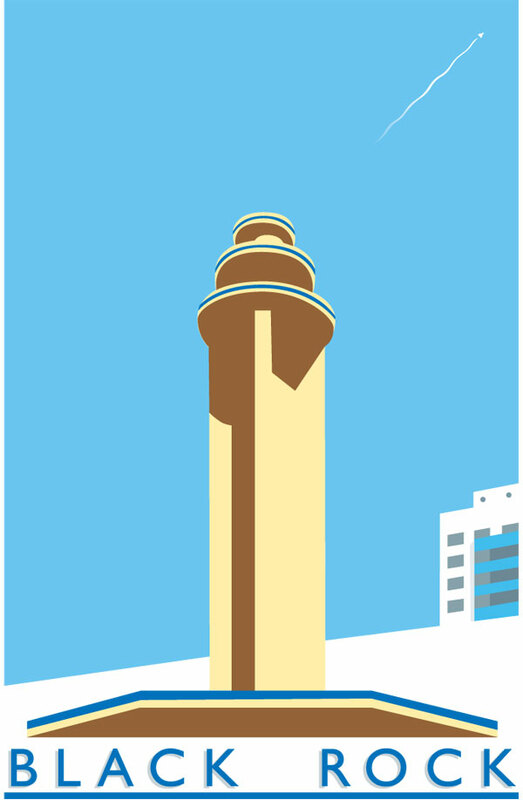 I’ve been asked if the images adorning the Astoria cinema in Brighton are for sale as prints. Yes, they are! Seven Sisters and Shoreham Airport were originally screenprints and have all sold out (tho I have one or two ‘seconds’ of Seven Sisters available). 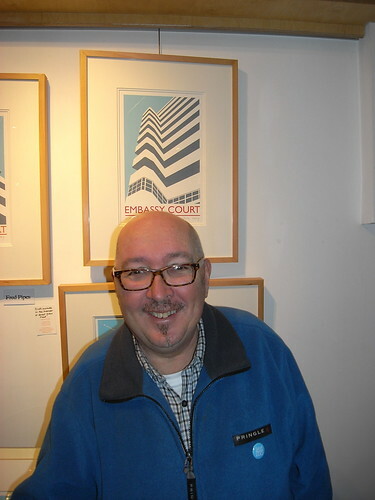 The Astoria and Embassy Court were always digital prints. All are now available as giclee prints, A3+ size (329mm x 483mm) on 310gsm (that’s thick and heavy) 100% cotton mould-made Hahnemuhle ‘William Turner’ paper printed in 8-colour archival pigment inks that shouldn’t fade. Some are also available as A4 prints on 190gsm paper. The price direct from me is £40 each, they may well be dearer through a gallery or Open House to take into account the commission taken. If you are a dear old friend and I’m in a good mood I may well give you a handsome discount! A different view of Embassy Court is also available. My latest tribute to Ed Ruscha. Done in Freehand with some ‘painting’ in Photoshop. If you turn to the last page in the Winter 2009 issue of Arty magazine, you’ll see a feature on Yours Truly as ‘Personal View’. The issue also features my neighbour Angie Meaden Bonnel, who lets me show work at her Dragonfly House.